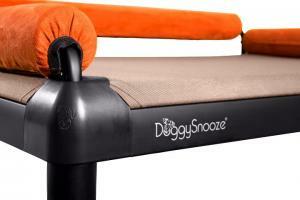 We claim that the DoggySnooze dog bed can be classified as an orthopedic dog bed, so we better explain why. We also use the term healthy dog bed, so when something is orthopedic, something is healthy. We prefer to call our dog bed healthy over orthopedic, because we believe that as a resting place, it is much healthier for the long-term, while the term orthopedic gives a sense of being therapeutic. Well, let’s analyze it and see whether we can classify as healthy, orthopedic, just comfy, or all of the above. First, we would like to make a disclaimer here. There is no government standard or official designation that will qualify one dog bed orthopedic and the other not. This reality has created much confusion in the dog bedding industry, to the point that the typical consumer is not able to determine if a mattress is orthopedic or not. So, this article is written to reflect our opinion about what should be classified as orthopedic or what is healthy for your dog in the long-term. The Merriam-Webster dictionary definition of orthopedic is “marked by or affected with a skeletal deformity, disorder, or injury” and the Answers.com website definition is “The branch of medicine that deals with the prevention or correction of injuries or disorders of the skeletal system and associated muscles, joints, and ligaments.” We rather prefer to stick with the Answers.com definition and believe that the DoggySnooze dog bed is best suitable for prevention. I am not sure if any dog bed can be used for therapeutic or orthopedic correction. The definition on Wikipedia for an orthopedic mattress is a mattress designed to give extra back support. Having a number of definitions together we can see if the DoggySnooze can be classified as orthopedic, but we also need to look at whether this bed is right (in other words, healthy) for your dog. We designed the DoggySnooze dog bed with the health of your best companion first and foremost in mind without looking up classifications or standards (as determined earlier which do not exist), but rather by using the input of experienced and renowned veterinarians. Let’s first take a look at the different elements of the bed of what we have and have not yet described. We do not believe in cute, soft looking cushions. They look extremely comfy and they are certainly fun to lay on for a short while, but being used as a bed to sleep on? Imagine yourself sleeping for a night on the couch. You likely wake up feeling tired with back pain. Have you ever slept on those extremely stiff mattresses? Some hotels in China still have them. They are very uncomfortable when you first lay down on them, but you wake up well-rested without back pain. Have you ever slept on a Tempur-Pedic mattress? They are very comfortable and the top layer forms itself to the shape of the body. With the DoggySnooze we designed something in the middle. A bed layer that is somewhat stiff (the stiffness is adjustable) and the layer forms itself to the body. But, as we use a Cordura nylon fabric layer, it has more features that allow it to be classified as an orthopedic dog bed. 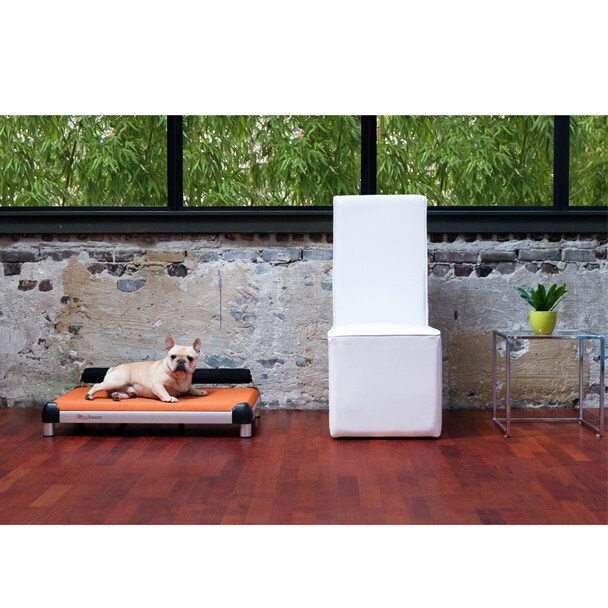 The nylon fabric will adjust itself to the body temperature of the dog. 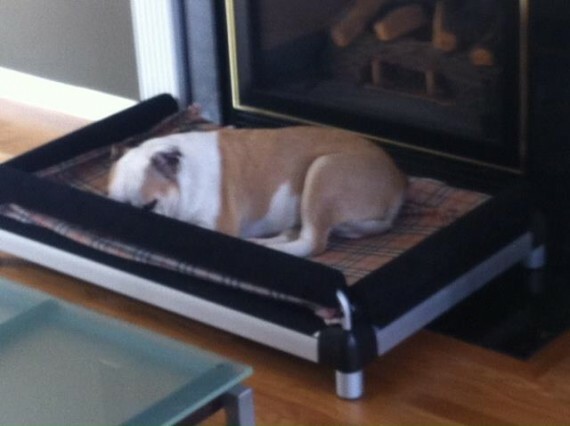 There are heated dog beds on the market that are comparable to the heated seats in your car. For some it is comfortable, but if you sleep your life always using an electric heating blanket you disable your body’s heating system. Assuming that you don’t expose your dog to a freezing temperature sleeping environment we do not see any value in heated dog beds, but this is just our opinion. A heated dog bed can temporarily work for an injured dog, but most dogs can be found on the floor next to the heated dog bed to cool off. The Cordura nylon fabric layer not only aids to adjust to the body temperature, the breathable feature of the bed releases body odor, so it doesn’t get sweaty. Another benefit of avoiding sweat or body odor accumulation is that the bed won’t smell so badly.So, the question is whether the stiff, adjustable nylon fabric layer in an elevated position would make it orthopedic. It partially does, but we believe there are more factors to it. There are other beds on the market with an elevated Cordura fabric layer who classify themselves as orthopedic, while most dog beds classified as orthopedic are made out of a layer of memory foam. Does the elevated Cordura nylon layer win over the memory foam to be classified as orthopedic? 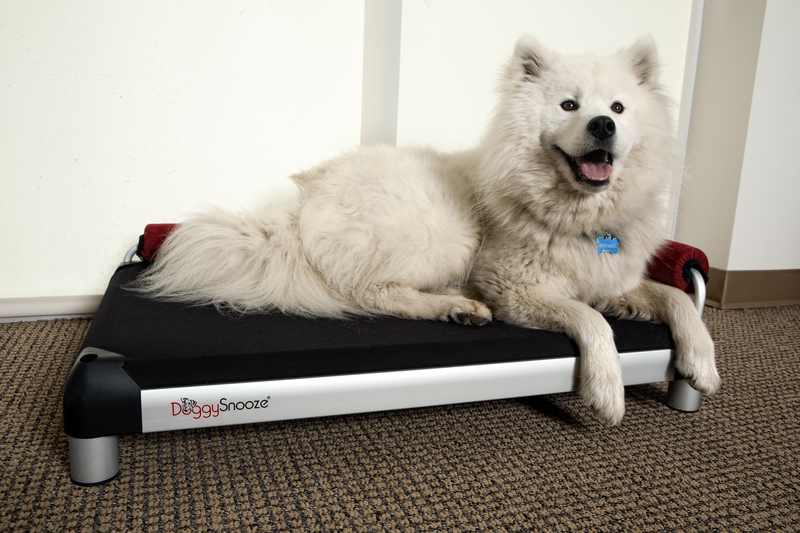 As designers of the DoggySnooze dog bed, we believe that being truly orthopedic is a combination of factors and we have tried to incorporate them into the design. However we choose the elevated nylon Cordura layer over the memory foam for the aforementioned mentioned reasons. A memory foam layer would work better for humans as we are build with broader shoulders, but we believe that the nylon fabric layer fits a dog’s body given a dog’s various resting and sleeping positions. 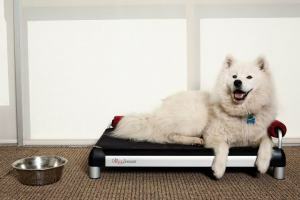 What are the other factors contributing to a very orthopedic dog bed? The unique stiffness control system is one of them. If you have a heavy dog with sore muscles, lower the level of stiffness of the layer. If you have a young puppy that needs a good rest at night, let it sleep on a stiff bed layer. Well, it might have too much energy the next morning, but at least you know that in the long-term, it might be saved or delayed from the crippling hip dysplasia that affects so many dogs. 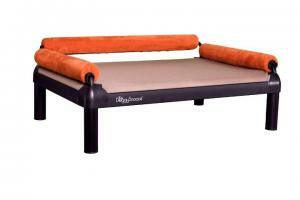 Another feature contributing to the bed’s orthopedic benefits is the bolsters. We use very dense foam, so it works for the back and the head. A dog likes to feel back support (which wasn’t in the Wikipedia definition of orthopedic, in regards to back support) while taking a “deep” nap. The side supports functions wonderfully as a head cushion, and if your dog likes to stretch out, remove the side supports. At the very least the bolster supports contribute to the orthopedic function. To summarize this lengthy analysis the “elevated stiffness controlled breathable nylon fabric layer” in combination with the bolster supports make the DoggySnooze dog bed a truly orthopedic dog bed.